Kiss Fungi-Gone Anti-Fungal Treatment is an ointment used to alleviate the burning, itching, scaling and cracking symptoms associated with Athlete’s Foot, Ringworm and Jock Itch. Tolnaftate (1%) – a synthetic thiocarbamate used an anti-fungal agent. Clean affected area with warm soap and water. Thoroughly dry area. Apply a thin coat to area twice daily. For Athlete’s Foot, use a minimum of four weeks. On the official Kiss Fungi-Gone website you can buy one package for $9.99. This is for a half-ounce bottle. I found no mention of a Money-Back Guarantee for Kiss Fungi-Gone Anti-Fungal Treatment. Kiss Fungi-Gone is a mild treatment for the relief of Athlete’s Foot, Jock Itch and Ringworm. Because the active ingredient is mild, you may have to use a longer period of time than some other products. 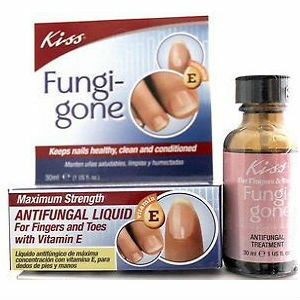 With a price of $9.99 for a half-ounce bottle, and no money back guarantee, Kiss Fungi-Gone Anti-Fungal Treatment may become a pricing solution. Jack Stevens	reviewed Kiss Fungi-Gone	on July 2nd	 and gave it a rating of 3.